My favorite things to do when I’m not working (and I don’t have any other obligations) are reading, watching movies, or getting sucked into a television series. In fact, our living room TV is mounted above the fire place, surrounded by books that live on the mantle. My desk, where all the writing takes place, is only a few feet away. It’s like all my favorite things in one place! It used to be you had to wait painstaking week, after painstaking week, for a new episode of a favorite show. And, even if you were able to find a show to watch after it finished airing, you had to hope that Blockbuster or the library had it in stock. Even when Netflix first started, instant gratification by way of streaming video hadn’t happened, so you had to wait for that little red envelope to arrive in the mail with your next-in-the-list selection. These days, binge-worthy TV shows aren’t hard to come by, especially with services like Netflix streaming, Hulu, and Amazon Instant Video. The instant gratification of playback, coupled with vast quantities of shows and movies is pretty amazing. In fact, there are SO many options out there, it’s easy to get a little snow blind as you’re scrolling through the titles. Thankfully Facebook and Pinterest make it easier to stay on top of your friends’ favorites, and Netflix and Amazon Video are quick to suggest shows “you might like” as you’re browsing through the titles. 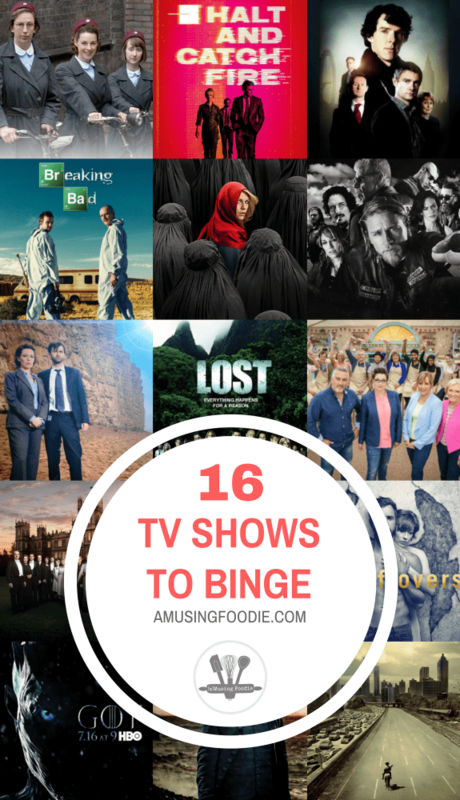 In any event, if you’re at a loss for something to enjoy, here are 16 TV shows to binge that I’ve watched over the years—and loved. *Join HBO Free Trial or join SHOWTIME Free Trial or check out and join Amazon Channels Free Trial just in time for the new Game of Thrones season, to begin Homeland, or to get ready for Outlander season 3! A few years ago, after dozens of friends espoused their love for all things Crawley, I finally decided to find out what all the fuss was about with this Masterpiece show called Downton Abbey. So I began Season 1, which easily flowed into Season 2, and so on—and, you should, too. Show description: Downton Abbey—a sprawling, lavish Edwardian mansion nestled in the Yorkshire landscape—needs an heir. Dame Maggy Smith stars as Violet, the stubborn Dowager Countess of Grantham matriarch of Downton. Hugh Bonneville stars as her son, the stoic, unflappable Lord Crawley. Elizabeth McGovern is his far-sighted American wife, Cora. Get started with the original, un-edited, first season of Downton Abbey, here! P.S. I hear rumors of a Downton Abbey movie! Sherlock, staring Benedict Cumberbatch, is another example of a show with so many fans, but for some reason I never caught as it aired. Thanks to Netflix, I was able to catch up on all three seasons in about a week’s time, just before last January’s “Abominable Bride” special aired and the fourth season aired. It’s both helpful (for binge-watching) and annoying (because you want more) that each season is only three episodes long. I could easily watch four times as many stories per season. Show description: A modern update finds the famous sleuth and his doctor partner solving crime in 21st century London. Get started with Sherlock, here! Lost first aired in 2004 and kept its fans mesmerized—yes, me included—and on the edge of their seats for six seasons. Unlike some of the other shows I put off watching until I could stream them endlessly over the course of a weekend, I watched Lost real-time. Like, week-to-week, with horrendously long pauses between seasons. Each episode left me hanging, and desperately waiting for the next Sunday to roll around so I could see what the next twist and turn would be for Jack, Kate, Sawyer, Jin, and the rest of the group. There were online groups devoted to predicting future plots, and uncovering hidden clues within the story. ABC started airing “pop up video” style reruns of prior week’s episodes in advance of new ones, so that fans could get even more in-depth intel on what the heck was going on with the story. (Spoiler: it’s near impossible.) Lost was a phenomenon. Show description: After their plane crashes on a deserted island, a diverse group of people must adapt to their new home and contend with the island’s enigmatic forces. Pro tip: More than any other show, you MUST watch this one in order, starting with episode one in the first season. Don’t skip ahead; don’t start in the middle. Watch them in order. I just finished re-watching the whole thing, beginning with S1:E1 and it was almost as fantastic as the first go around. Get started with Lost, here! I never thought I’d find a story about crystal meth, and the characters involved, captivating. But, there I was, binge-watching Breaking Bad over the course of a couple weeks, cheering for Bryan Cranston’s character (and tearing up for him, and angry with him, and laughing with him, and…). Show description: A high school chemistry teacher dying of cancer teams up with a former student to secure his family’s future by manufacturing and selling crystal meth. Get started with Breaking Bad, here! It took me forever to watch The Walking Dead, mostly because I kept hearing how violent it was, and also I couldn’t wrap my head around a show devoted to zombies. Gosh, I’m so glad I didn’t listened to my many friends to kept saying, “WATCH IT.” I was immediately sucked in, hungrily trying to wrap head around what the heck was going on, all the zombies, and how in the world anyone could even begin to survive in such a precarious and frightening situation. Five-and-a-half seasons (and two weeks) later, I’m eagerly awaiting the second half of season six to air in real time. Show description: Rick Grimes is a former Sheriff’s deputy who has been in a coma for several months after being shot while on duty. When he awakens he discovers that the world has been ravished by a zombie epidemic of apocalyptic proportions, and that he seems to be the only person still alive. After returning home to discover his wife and son missing, he heads for Atlanta to search for his family. Narrowly escaping death at the hands of the zombies on arrival in Atlanta he is aided by another survivor, Glenn, who takes Rick to a camp outside the town. Get started with The Walking Dead, here! After reading the first in the Outlander book series, streaming the television show was a no-brainer. You can read all my thoughts about the book and the show in detail, here. Show description: While on a second honeymoon with her husband, British combat nurse Claire Randall is transported back in time to 1743 Scotland. Accused of being a spy, she is catapulted into danger and finds herself torn between two men in vastly different times. Get started with Outlander, here! When I finally started watching The Great British Baking Show, it was one of those, “Why haven’t I been watching this until now? !” moments for me. It’s the fun of a food competition, without the cattiness and nonsense that goes along with so many American shows. It’s a little quirky, pretty funny, quite endearing—and you get the pleasure of listening to lots of English accents, while also learning fun new phrases like “it’s a good bake” or “that’s a perfect sponge.” Brilliant! Show description: A talented bunch of amateur bakers face off in a 10-week competition, whipping up their best dishes in the hopes of being named the U.K.’s best. Get started with The Great British Baking Show, here! I have a special place in my heart for Mandy Patinkin and Clare Danes, thanks to obsessions with The Princess Bride and My So Called Life in the late ’80s and early ’90s. That being said, their characters in Homeland couldn’t be any more different than those they play in their respective decades-ago movie and TV show. So, naturally I was skeptical that I’d enjoy Homeland at all. Boy, was I wrong. Totally hooked. Show description: When Marine Nicolas Brody is hailed as a hero after he returns home from eight years of captivity in Iraq, intelligence officer Carrie Mathison is the only one who suspects that he may have been turned. Get started with Homeland, here! An epic story of Middle Earth proportions, Game of Thrones is filled with wonderful character development, crazy good story lines, and dragons. You can read all my thoughts about the show and cool resources to bookmark while you watch, here. Show description: While a civil war brews between several noble families, in Westeros, the children of the former rulers of the land attempt to rise up to power. Meanwhile a forgotten race, bent on destruction, return after thousands of years in the North. Get started with Game of Thrones, here! I watched Wentworth for the first time after hearing a few different friends talk about how good it was. While the setting is a women’s penitentiary (Wentworth Prison in Australia), it’s nothing like Orange is the New Black. Surprising depth and intimate storylines make you drawn to these characters, and caused me to shed more than a few tears throughout the seasons. Show description: Bea Smith’s sentence at Wentworth begins as she sides with tough girl Franky’s gang and gets caught up in a riot that leaves the prisoner governor dead. Get started with Wentworth, here! Broadchurch was a Netflix suggestion a few years ago (the British version, not the American version), and on a whim I decided to watch the first few episodes. Wow, what a show! The character development, the mystery that keeps you guessing, the brilliant acting. It’s not always cheery, but the sad story arch is worth it. I’m hopeful we get another season Stateside. Show description: The town of Broadchurch is bracing itself for an annual influx of holiday tourists, but 11-year-old Danny Latimer is missing. Get started with Broadchurch, here! Show description: In the first season Jax’s journey begins with two discoveries: his son’s harrowing premature birth by Wendy Case, his crank-addicted ex-wife, and the discovery of a life-altering document written by his father who died fourteen years earlier. Get started with Sons of Anarchy, here! At the suggestion of a friend, and with the knowledge that AMC makes some really really good shows, I began Halt and Catch Fire about a year ago without any knowledge of the premise. As a member of the newly coined “Xennials,” I appreciate a good story from the late ’70s and early- to mid-’80s, and this one is done so well, with strong female leads, and a story that keeps you guessing. Show description: Re-creating the dawn of the personal computer era, this digital drama tracks the fates of an industry visionary and his brilliant colleagues. Get started with Halt and Catch Fire, here! So I watched the first few episodes, got distracted, and then forgot about it for about six months. Fast forward to last month when I was in the mood for a new show, and this one caught my eye again. I decided to give it a go one more time, starting again from the very beginning. And, wow. What a journey! It’s obvious that Damon Lindelof is a creator, and I’ll just leave it at that. Show description: This one-hour drama focuses on a suburban town whose preconceptions are shattered after a global event dubbed “The Departure” (which may or may not have been the Biblical “rapture”), in which 140 million people – 2% of the world’s population – disappeared without a trace. Seen primarily through the eyes of a beleaguered police chief, the series shows how ordinary people react to the inexplicable. Get started with The Leftovers, here! For those of you aching for something to fill the void of Downton Abbey being done and Outlander being in a hiatus, Poldark is the show for you! Show description: It’s 1783 and Ross Poldark returns from the American War of Independence to his beloved Cornwall to find his world in ruins: his father dead, the family mine long since closed, his house wrecked and his sweetheart pledged to marry his cousin. But Ross finds that hope and love can be found when you are least expecting it. Get started with Poldark, here! I’m not sure there’s been a more heartwarming, endearing, emotionally satisfying series than Call the Midwife. Leave it to BBC to create a show that empowers women and gives a peek into the real world of midwifery and childbirth in the mid-1900s. What a well done show! Show description: Newly qualified midwife Jenny Lee arrives in the East End to embark on a challenging career alongside an order of nursing nuns. Get started with Call the Midwife, here!